Pawcatuck, Conn. – Davis-Standard, a recognized global leader in high-performance converting and extrusion systems, will feature its recently-introduced dsX™ technology in Hall 16, booth #A43 during K 2013, October 16 – 23, including the high-value, pre-engineered dsX flex-pack™ extrusion coating line, the new ultra-compact dsX med-tube™ medical tubing system, and the unveiling of the innovative dsX s-tretch™ line for cast film. Davis-Standard is offering a conveniently-scheduled shuttle service to the company's Erkrath facility where the new dsX flex-pack™ extrusion coating line and dsX s-tretch™ cast film line will be spotlighted. 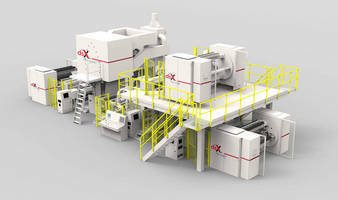 The new dsX flex-pack™ extrusion coating line (patent pending) provides converters and printers with a pre-engineered system that will give them distinct advantages in the price-sensitive global flexible packaging market. The high-value system can be delivered in as little as six months and is available in two layouts to accommodate almost any plant space requirements. The dsX flex-pack™ provides customers with all the capabilities and flexibility needed to compete effectively in a variety of rapidly emerging application opportunities including: salted snack and noodle bags, toothpaste tubes, sachet packs personal care products, condiment packs and stand-up pouches. Advanced computer technology, standard on the dsX flex-pack™, continually adjusts the product profile for best performance and allows for remote access of the line for troubleshooting and updating over a secure internet connection. The optimized dsX s-tretch™ pre-stretch cast film extrusion line is the first in-line pre-stretch system enabling customers to run thinner films at higher speeds, allowing stretch film providers to produce consistent, high-quality pre-stretch film with greater efficiency. The 2-meter wide line has the advantage of a lower footprint, yet allows for growth. The dsX s-tretch™ system is comprehensive yet flexible – its pre-engineered technology is available in as little as six months with both five and seven-layer options. The line will be offered with environmentally-friendly coreless technology in the future, reducing both material and disposable cost. The ultra-compact dsX med-tube™ medical tubing system, a variation of Davis-Standard's widely used medical tubing systems, has been optimized for both value and versatility. The dsX med-tube™ system offers a smaller footprint for clean rooms, language-specific control systems and fast delivery. A unique co-extruder arrangement allows for processing materials ranging from polypropylene (PP) to fluorinated ethylene polypropylene (FEP) by changing feedscrews. Systems are available for single lumen, multi-lumen, IV catheter, corrugated drainage, integrated bump tubing and multi-layer tubing. Innovations Displayed at Erkrath Facility – Davis-Standard is offering shuttle service from Düsseldorf to the company's facility in Erkrath (about 20 minutes away) for the display of the new dsX flex-pack™ and dsX s-tretch™ lines. The transportation schedule for this service will be available at the show. The new dsX™ technology is representative of the many new innovations to be introduced as part of Davis-Standard's Global Advantage initiative, helping customers gain a competitive edge by optimizing their ability to respond to the ever-changing needs of their markets. Davis-Standard has taken great care to merge its best technology into cost-effective, highly-engineered packages that are supported by regional engineering and service teams. Davis-Standard's experts in extrusion and converting will be available to discuss these new offerings along with the company's current technologically-advanced solutions to the global polymer and rubber processing industries, all with the goal of providing exceptional value for customers. For more information prior to the show, visit www.davis-standard.com. For more information on Davis-Standard's exhibit at K 2013, Hall 16, booth #A43, or for more information on the Open House at Davis-Standard's facility in Erkrath during the show, contact us at info@davis-standard.com. Davis-Standard (www.davis-standard.com), headquartered in Pawcatuck, Conn., is a global leader in the design, development and distribution of extrusion and converting technology. Davis-Standard systems encompass over 10 product lines to support manufacturing applications and customers within every major industry. This includes the agriculture, automotive, construction, healthcare, energy, electronics, food and beverage packaging, and retail industries, among others. With more than 950 employees worldwide and a network of independent sales agents and suppliers in nearly every country, Davis-Standard is committed to engineering equipment that is cost effective, environmentally friendly, and offers a high return on investment. The company has three manufacturing and technical facilities in the United States, as well as subsidiaries with facilities in China, Germany and the United Kingdom.